One in 10 women of reproductive age in North America have endometriosis as do 200 million women worldwide. The average time to get a diagnosis for endometriosis is 10 years. You read that right…a decade. Endometriosis is a condition where the uterine lining grows and implants in areas of the body where it normally shouldn’t. Endometrial tissue can occupy fallopian tubes, ovaries, areas of the pelvis, bladder, bowels and even the diaphragm. Women experience pain at different times in their cycle; usually most intensely during their period, but it is also important to know that, when it comes to pain and endometriosis, there is no rhyme or reason. Individuals with small amounts of endometrial tissue may experience more pain than individuals with larger amounts, and vice versa. The endometrial tissue can cause pain, inflammation and scar tissue. It sounds like the symptoms of a painful period, right? What is often diagnosed as “just” a painful period more often than not can be symptoms suggesting endometriosis. These symptoms can be debilitating for women and often lead to time missing work, enjoyment in everyday activates as well as decreased quality of life. It is no surprise when dealing with chronic pain from a condition such as endometriosis that anxiety and depression are also prevalent. Although endometriosis can be suspected by symptoms the only true way to diagnose this condition is through laparoscopic surgery. Treatment options include medications such as hormonal suppression and surgery. If you suspect you may have endometriosis it is important to see a gynecologist to discuss your treatment options. The effect of acupuncture in the treatment of endometriosis-related pain is likely mediated by endocrine and cytokine changes, as well as by anti-inflammatory and analgesic effects. 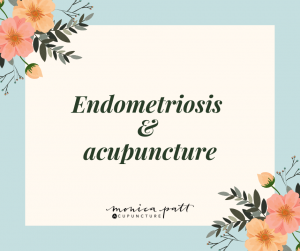 Basically, acupuncture reduces inflammation and can also reduce pain as well as dysmenorrhea (sever pain during the menstural cycle) that is often associated with endometriosis and improve your day-to-day symptoms. In fact, acupuncture has been found to be as effective as nonsteroidal anti-inflammatory Drugs (such as Advil, Aspirin, Motrin, Aleve) for relieving pain in women experiencing dysmenorrhea. In addition to pain reduction acupuncture can support hormonal regulation. With the use of targeted supplements and herbal formulas we can work on a treatment plan that decreases overall inflammation in the body and reduce pain. Systemic Enzymes – Enzymes are one of our top choices when dealing with endometriosis as they help decrease systemic inflammation that is present in the body with conditions like endometriosis, fibroids etc. These have an anti-inflammatory effect, break down scar tissue, regulate the immune system and improve blood flow as well as inhibiting pro-inflammatory cytokine secretion. N-acetylcysteine (NAC) -is another one of our favourite supplements to use for inflammatory conditions. It is virtually free of undesirable side effects and toxicity. NAC is a powerful supplement to boost glutathione levels in the liver and peripheral tissue. Glutathione is the most powerful antioxidant the body makes and helps with proper healing and maintenance of all cells, liver detoxification and the regulation of hormones such as estrogen, progesterone and testosterone. There is a component of inflammation with endometriosis and it is important to minimize foods that can contribute. The following foods are the most likely to cause inflammation in the body and include sugar and alcohol, wheat flour, dairy products and processed vegetable oils including soy, corn and canola oil. Many women suffering from endometriosis and menstrual pain notice a large difference when eliminating dairy and wheat flour from their diet. Start with eliminating these food for a total of three months and reassess how you are feeling. So we covered what foods to avoid but what foods can you eat? Glad you asked! Choose fatty fish with low mercury such as wild salmon a few times per week. They are high in omega 3 fats (DHA and EPA) and provide anti-inflammatory benefits. If you aren’t a fan of fish you can also supplement with a high quality fish oil to receive the same benefits. Include vegetables that belong to the brassica family including broccoli, kale, cauliflower, cabbage, brussels sprouts and collard greens. These vegetables have a compound called indole-3-carbinol (I3C) and improves estrogen metabolism while supporting liver function. They are also great for estrogen dominant conditions such as endometriosis, PMS and fibroids. Looking for more endo-friendly, anti-inflammatory recipes? This Endo Life has a great repository of dishes to try. While there is no known cure for endometriosis, we offer treatments and supplements that can aid in elevating your quality of life. Living with chronic pain and the symptoms that come with endometriosis can be challenging at times, but with a customized treatment plan from us, we work work with you to ensure the right course of action for your life with endometriosis. 1)Eur J Obstet Gynecol Reprod Biol. 2013 Jul;169(2):292-5. doi: 10.1016/j.ejogrb.2013.02.016. Epub 2013 Mar 20. 3)Porpora, M. et al. (2013). A promise in the treatment of endometriosis: an observational cohort study on ovarian endometrioma reduction by N-acetylcysteine. Evidence-based complementary and alternative medicine : eCAM, 2013, 240702.